NEXT LEVEL DESIGN. NEXT LEVEL ALIGNMENT. NEXT LEVEL PERFORMANCE. As the most technical putter line Scotty Cameron has offered to date, the 2019 Phantom X family presents mallet players with a variety of new setups in a cohesive mix of five new head styles, shaft bends and alignment options with new, multi-material construction including solid aluminum faces anodized black, bold accent colors and 303 stainless steel. 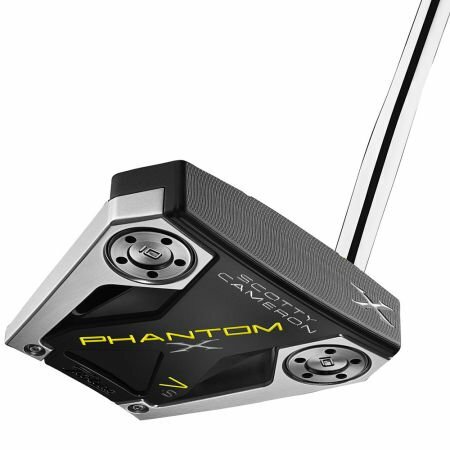 With a shorter single bend shaft crafted to promote slight toe flow with forgiveness, the Phantom X 7.5 employs a raised center flange offering a continuous, connected surface accented with neon yellow alignment cues from the leading edge through the back flange. Also available in a left-handed model. COMBINATION ALIGNMENT - A unique pairing of traditional topline visibility and sight dot alignment with the sweet spot combined with elongated sight lines milled into the raised flange from the face’s leading edge to the back of the putter head frame the golf ball and provide expert alignment guidance at address. LOW-BEND SHAFT TECHNOLOGY - The stepless steel shaft has been designed with a single 'low' bend aimed directly down the target line to slightly enhance toe flow—or arc—in the putting stroke.